Kek kek kek kek. 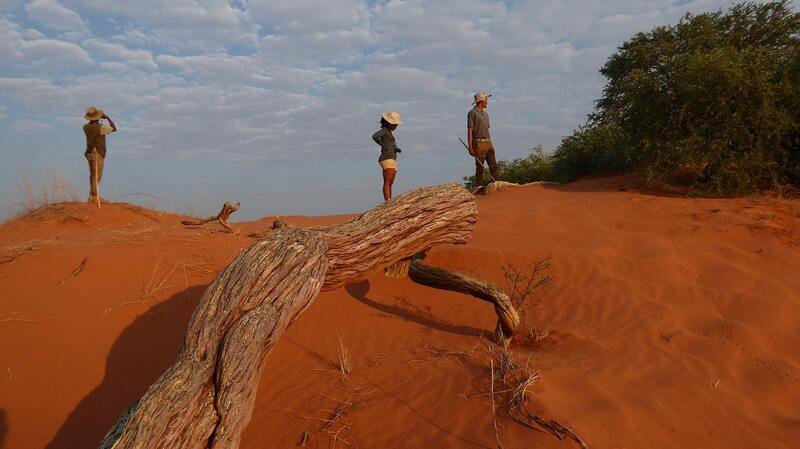 “That’s the sound of spring in the Kalahari,” said my guide. It was the call of the male barking gecko doing its utmost to attract a female to its burrow and it seemed to follow us around. My guide was Mans Maasdorp and he may have been born in Upington, but he is a true ǂKhomani San. I could tell that his heart is here in the arid lands north of the Orange River. 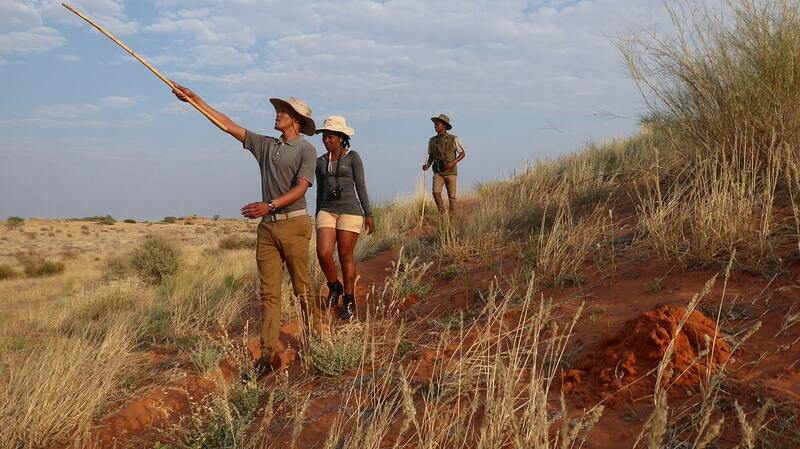 We were in the Kgalagadi Transfrontier Park exploring the dunes near !Xaus pan. The name means heart in the Nama (or Khoekhoe) language, due to its shape. We got back to examining the dunes, bathed in early morning light. These were not the bare red sand I’d imagined. Mans said that dunes without grass are the result of overgrazing. Protected in the enormous park these dunes were rich in plant life, and host to thriving populations of rodents and reptiles, birds and mammals. Taking a closer look at the tubers that sustain life in this arid region. A million tiny tracks dappled the sand in signature patterns. 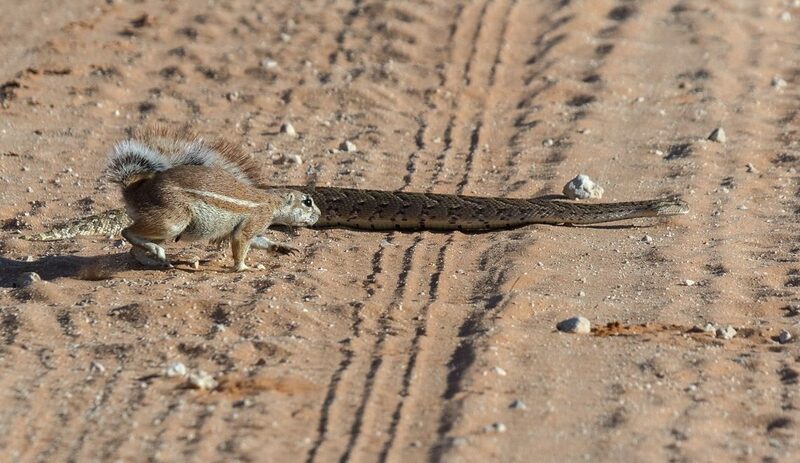 Rodents, skinks, beetles, scorpions, Namaqua doves. My eyes followed a tiny trail around a colourful clump of wild everlasting and led me to a chubby rodent, a whistling rat, hanging out at the mouth of a burrow. He was not alone, but they are well camouflaged and not easy to spot until they move. In a similar way, the four-striped grass mice like to stay still when approached. They use the blackthorn bushes as a natural defence against predators such as wild cats and birds. Mans said that even kudus can reverse into a blackthorn if threatened by a lion, the barbed thorns forming a good barrier. Mans was happy to talk geckos and rodents, but he really got into his swing when telling me of the useful plants in this environment, a veritable pharmacy of the dunes. The devil’s claw plant does not look like much, but it’s a proven source of anti-rheumatic and anti-inflammatory medicines. Mans dug out the tubers by hand. Nearby, a buffalo thorn was not just a home for weaver nests, but a source of berries to make alcohol, while the roots can be used for stomach ailments. The Kalahari may be a desert, but it is home to a variety of grasses. We moved on, hands brushing stiff clumps of grass, making an oceanic sound. Mans said the local name is gami grass from the Nama word for water. He pointed out the different types of grasses. Some, like Eragrostis, are perennial, others he calls “one-year grasses”. A little further on, Mans stopped at a small succulent. “This is the candle bush, because when it’s dry Bushmen use it as a candle”. How do they light it, I asked. “With one of these,” said Mans with a smile, pulling a Bic lighter from his pocket. On the second morning at the very comfortable !Xaus lodge, I woke to the sound of lion at close quarters. I found him drinking from the water trough in the pan, 80m from the chalet. When feeding, they need to come to drink often. His presence nearby did not deter us from going for another walk, as a member of staff was charged with keeping an eye on him, and assistant guide Castro Maluti carried a two-way radio. Mans had not run out of interesting facts to share. We started by looking for the local meerkat family, but they were staying underground. 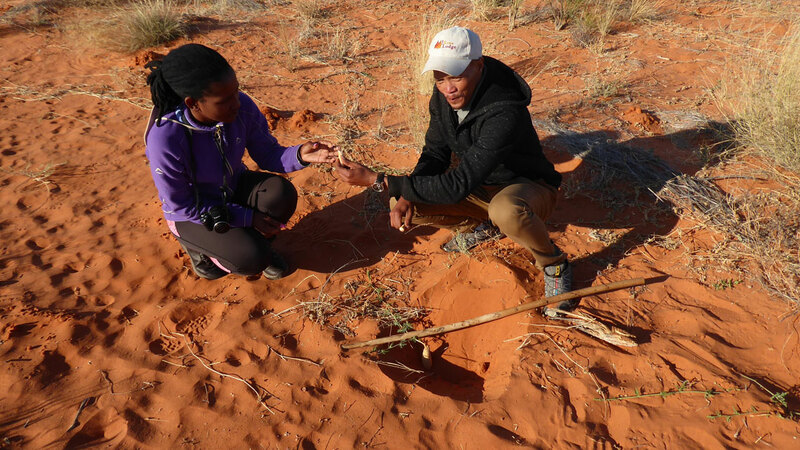 Then Mans gathered a selection of seed pods from camelthorn and other trees and explained their uses. Later I was to see how the Bushmen fashion these into attractive jewellery. They use blackthorn wood to make walking and digging sticks and fence poles. The birds were not ignored. As well as the many weaver birds, we found flocks of red-headed finches and several southern pale chanting goshawk. The area is popular with ground-dwelling birds and we spotted the northern black korhaan, kori bustard and ostrich. Mans is skilled at reading tracks in the sand but he also keeps an eye on the sky above. 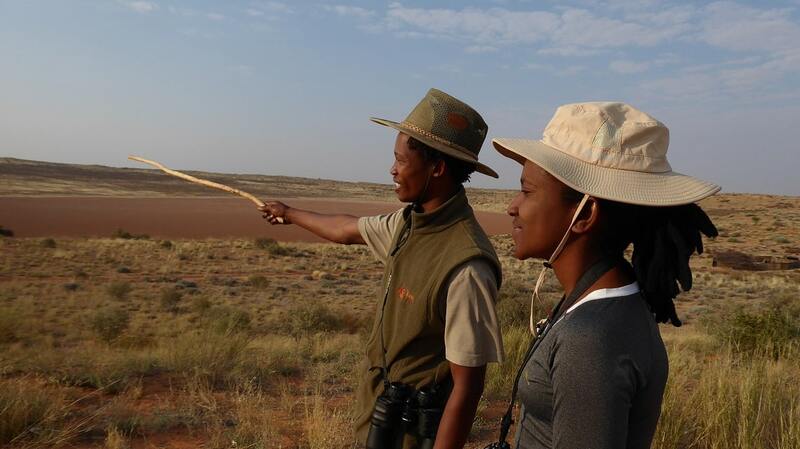 The Kgalagadi Transfrontier Park is a noteworthy birding destination, especially for raptors. The stinking shepherd’s bush (Boscia foetida) is greatly valued by the Bushmen. In December, the berries can be eaten or used to make a sort of yoghurt. The scent of its flower leads to the popular name of stinking shepherd’s tree. The roots of its cousin, Boscia albitrunca, can be roasted and ground to make a sort of coffee substitute. Of course, the shepherd name comes from its shade-giving properties, and Mans claimed that it can be 20°C lower in temperature under its branches. Indeed, that afternoon as we went for a drive, we knew exactly where to look for “our” lion and found him sprawled belly up under the shepherd’s tree. 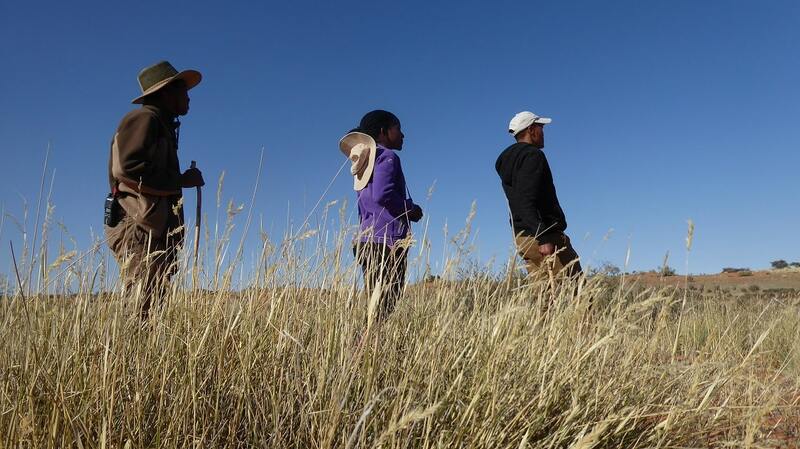 Walks are not too long, with the emphasis on learning about the flora and smaller fauna of these arid lands. A night drive is highly recommended, with African wild cat, hyena, bat-eared fox, spring hare and spotted eagle-owl to be found. 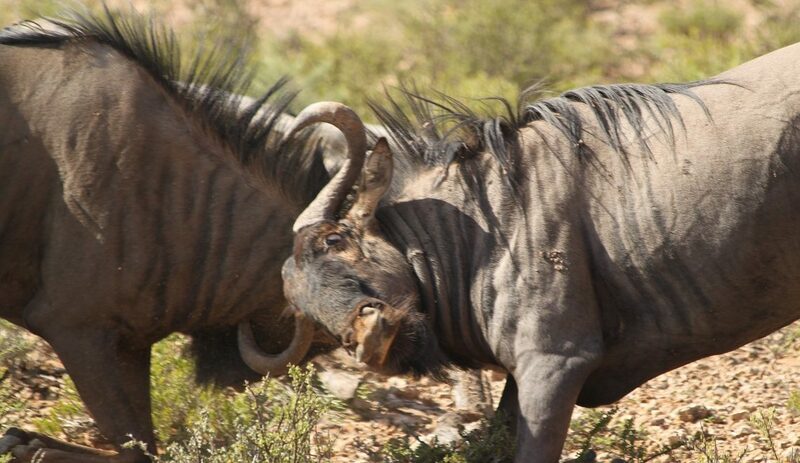 Game drives are also offered from these SANParks camps: Twee Rivieren, Nossob, Mata-Mata and the Kalahari Tented Camp. A daypack for camera, binoculars, sunscreen, etc. Hlengiwe Magagula is the author of the Guide to Walking in Kruger National Park (Available on Amazon from R80).